Astronomy Now - See the Moon meet the Red Planet on the UK night of 23 August | Astro What? 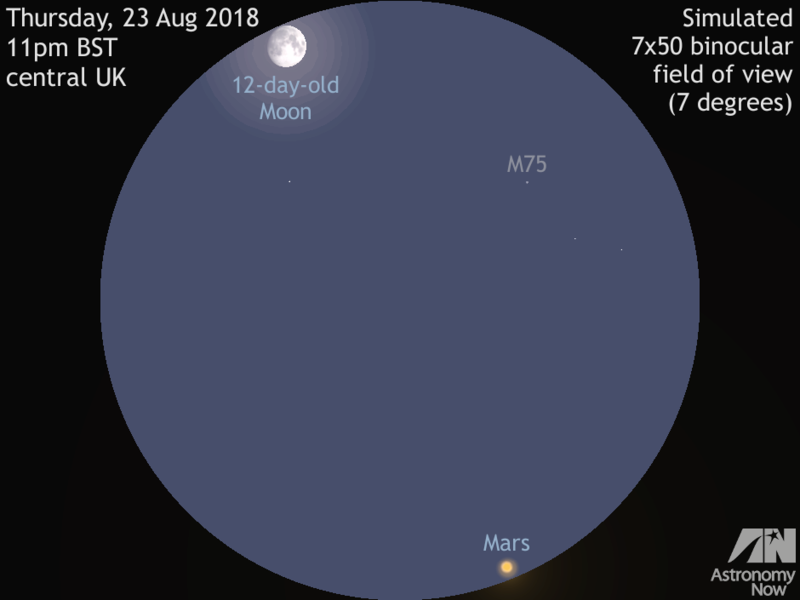 Look low in the southern sky of the UK around 11pm BST on Thursday, 23 August and, if you have a low-power binocular, you might just get the waxing 12-day-old Moon and planet Mars in the same field of view as they are only 6.6 degrees apart. Although you will have difficulty detecting it by the glare of the Moon, this field also contains magnitude +8.5 globular cluster Messier 75. AN graphic by Ade Ashford. The Red Planet may be almost four weeks past opposition, but it’s still an imposing sight low in the southern sky around local midnight. But if you are in any doubt about identifying it, the waxing gibbous Moon acts as a convenient celestial guide late into the UK evening of Thursday, 23 August. At 11pm BST on this night the 12-day-old Moon and Mars are separated by just 6.6 degrees, hence the pair can just squeeze into the same field of view of 7× binoculars. On the night of 23 August 2018 Mars lies in the constellation of Capricornus bordering on Sagittarius, the Red Planet burning with a magnitude -2.3 ochre glow. It lies 63.1 million kilometres (39.2 million miles) distant, hence its 96 percent illuminated gibbous disc spans 22.2 arcseconds in angular size. The waxing Moon lies 403,900 kilometres (251,000 miles) from the heart of the British Isles at 11pm BST this night, which means that the Red Planet is 156 times farther away. However, the latter only requires a telescope magnifying 80× to enlarge it to the same apparent size as the Moon to the unaided eye. Telescope owners have a bonus as Messier 75 lies just 3¼ degrees from the Moon tonight, but the magnitude +8.5 globular cluster will be seriously impaired by the lunar glare. If you do manage to locate M75 (also known as NGC 6864), spare a thought that this concentrated ball of stars some 130 light-years in diameter lies at a distance of 67,500 light-years, well beyond the centre of the Galaxy.